Frolicking lambs, fluffy bunny ears and cute chicks. Isn’t that what Easter is all about? Oh no. What about the mountains and mountains of chocolate and the joyous four day weekend! Not forgetting a trip to church for those so inclined. How about we combine all of those things this Easter to keep everyone in the troop content, for a little while anyway. Possible? Of course! Think lambing and working farm stays. Lambing is an incredibly busy and exhausting time of year for farmers, and it can extend for any period between December and April. With that in mind, our collection of lambing venues below is definitely not exhaustive but it gives you an idea of what lambing events are still happening around the country. It’s a great way to pass a few hours one weekend and invariably the farmers provide additional activities to entertain the kids and extend the visit for one and all. 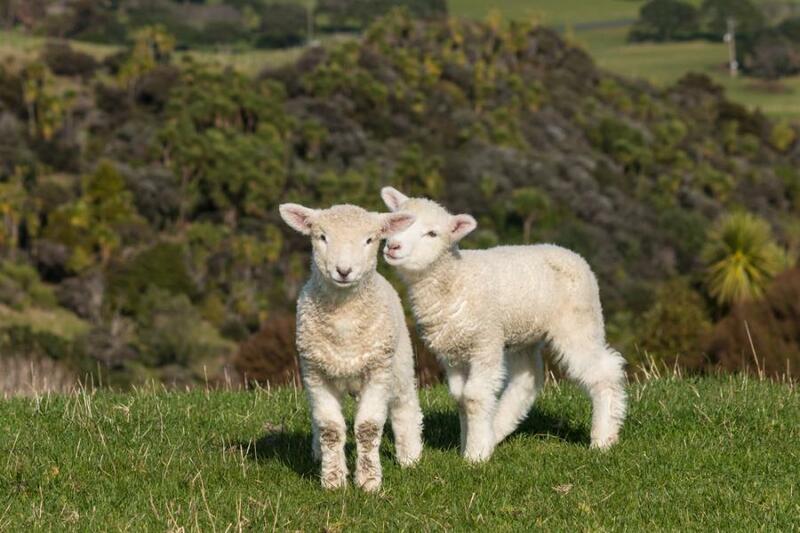 And for those who want to fill their Easter break with newborn lambs and chicks, and give the kids a real hands on farming experience, we’ve weaved in a few of the working farm stays bookable through Love Cottages. Opportunities vary from being able to walk around the farm and visit the animals, to helping the farmer feed them once or twice a day. So in the name of farming, fill your boots! Not far from Sudbury in Suffolk you’ll not only find a beautiful Tudor house in enormous grounds, but also a farm dedicated to rare breeds, particularly the Norfolk Horn sheep. These spiky horned, ‘at risk’ beauties start lambing in mid March, which makes them a perfect pick for Easter activities this year. Lambing is in full swing here, they’ve even announced the names of some of their new flock members on Instagram. If the lambs are already frolicking in the fields when you arrive, don’t worry. The farm is the epitome of our opening line: bunnies, chicks and even cute calves. If you’ve got a range of ages in tow, there’s plenty to entertain the whole family and their maize maze will be open just in time for Easter. You could be forgiven for forgetting you’d come here for the lambing. There are so many sheep related activities, you’ll be spoilt for choice (and possibly bent double with laughter at some of them). There’s a Sheep Show – think Crufts meets Strictly Come Dancing. And then there’s Sheep Racing – no sheep are harmed in this event, but the stuffed toy riders may not be upright come the end of the race. But back to lambing. They’ve timed this so well that any mum who’s seen her due date come and go will be envious to the hilt. Lambing occurred during Feb half term and there are more due during the Easter holidays – how’s that for timing! And wait for it… Easter newborns are also expected to include piglets and kids (that’s baby goats, normal maternity services are not provided). The accurately yet oddly named ‘bottle feeding show’ happens twice a day. Perched on a blustery hill in South Oxfordshire the Earth Trust Farm offers two lambing weekends for visitors to get up close to the freshest in the flock. This is a popular local affair and the barns are jam packed with parents and kids craning for sight of a lamb or newborn. There’s plenty to see and do aside from the lambing. As a charity focused on looking after where we live, its activities aim to reconnect kids and adults with the natural world. Yep, you got it: recycling to create art, climbing bales, going on a sheep hunt and an outdoorsy focused quiz. Lambing sessions open 10am-4pm, 24 & 25 March. Live the Easter idyll. Make your kid’s dreams come true. Relish the rural dream for a few days and see if you can work the welly look, handle the mud on your alloys, ignore the smell of muck, or survive being dragged from deep slumber by a crowing cockerel (got early rising kids? All is forgiven!). Only joking. Let’s focus on the freshest of free range eggs, access to farm shops selling locally reared meat and the look on the faces of your littlest when they hold a baby chick in their hands for the first time. Nothing beats a rural retreat and one that offers hands on experience too will go down a treat. So here are a few working farm stays to get you started. From the moment you turn into the long drive you need to mind the sheep. Despite 90 acres of farmland to explore, they’re just too nosy. Once you’ve settled in and dragged the kids away from the playroom, go and explore the farm goings-on and see what you can see! Guests are welcome to explore the farm and its friendly animals. Lambing starts here in April until the end of May. Visitors can help with bottle feeding too. Beyond the animals there is an adventure play area, games room, badger watching from a tree house in an oak tree, falconry by prior arrangement, fishing on the River Wye, marked trails and if you book in advance you can even try ‘Wild Camping’ for a night or two. Children are very welcome on the working farm (lambs, calves & ducks). And shared facilities include a games room with table tennis and pool table, and an outdoor play area. For warmer days and evenings there are picnic benches and a barbecue. Oh yes, summer will be here soon! Tregolls Farm has four cottages to choose from and plenty to keep young visitors occupied, lambing included. Every morning at 9am Farmer Lester welcomes the younger guests into the barn for a guided tour of the smaller farm animals including pet lambs, baby pygmy goats, chickens and rabbits. If the animals are hungry he’ll ask for help feeding them too. There’s also an outdoor adventure play area including ride-on tractors and cars as well as an indoor play area for when the weather gets a bit soggy. All that’s left is to find a cute kid to tag along with. Avoiding all contact between them and your Easter egg, of course. Happy Easter!